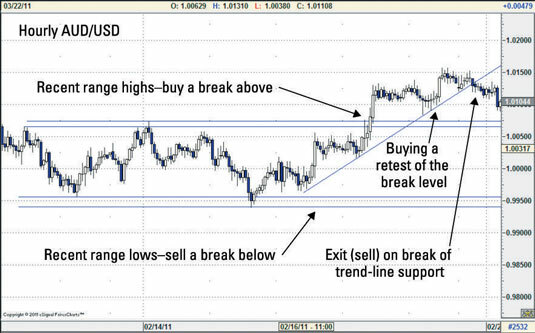 One way to trade a breakout is after the break has occurred. You may not have noticed the significance of a particular technical level, or you may not have left orders in overnight to exploit a break. You turn on your computer the next morning to discover that prices have jumped higher overnight and feel like you’ve missed the boat. But you may still get a chance to trade the breakout if prices return to re-test the breakout level. A retest refers to prices reversing direction after a break and returning to the breakout level to see if it will hold. In the case of a break to the upside, for example, after the initial wave of buying has run its course, prices may stall and trigger very short-term profit-taking selling. The tendency is for prices to return to the breakout level, which should now act as support and attract buying interest. You can use these retests to establish a position in the direction of the breakout, in this case getting long on the pullback. The figure shows where you could have bought on the retest of the break higher in AUD/USD. Note that prices did not make it exactly back to the breakout level. When trying to get in on a retest, you may consider allowing for a margin of error in case the exact level is not retested. You could also consider using a strategy of averaging into a position to establish a position on any pullbacks following a breakout. Here the averaging range would be between current prices and the break level. You may get the chance to buy/sell a retest of a breakout level. The reason is that not every breakout sees prices return to retest the break level. Some retests may retrace only a portion of the breakout move, stopping short of retesting the exact break level, which is typically a good sign that the break is for real and will continue. Other breakouts never look back and just keep going. But to the extent that it’s a common-enough phenomenon, you still need to be aware of and anticipate that prices may return to the breakout level. From a technical perspective, if prices do retest the breakout level, and the level holds, it’s a strong sign that the breakout is valid, because market interest is entering there in the direction of the break.